Located in the hub of Central America, the population of Nicaragua is approximately 5.2 million. With its territory covering an area of approximately 131,670 square km, Nicaragua is the largest country in the area. Adjacent to the Caribbean on the east and the Pacific on the west, Nicaragua borders Honduras on the north and Costa Rica on the south. Abundant with its geological landscape, the northern rugged highland of Nicaragua extends to the south, forming mountains with height ranging from 1,200 to 2,000 m. The slanted topography to the west forms sunken lake areas. Caribbean coast on the east abounds grassland and swamp. 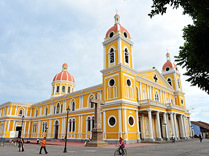 The three largest cities of Nicaragua are Managua, León, and Granada, and the latter situates within the area of Nicaragua Lake, the largest lake of the country. The first two cities situate at the bank of Lake Managua. 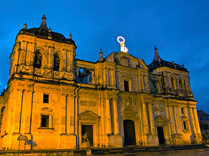 Besides, Masaya Province which is well known for handicraft and folk arts, Matagalpa which is a government declared natural reserve rich in agricultural and husbandry products, and Río San Juan Province known for its profound historical values and active development of ecological tour will also be worthwhile choices that tourists should not miss. 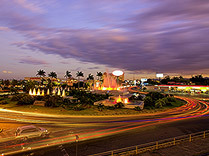 The capital City of Managua located within the Province of Managua was officially declared as the capital of the country in 1852. Managua was etymologically originated from Indian dialect of "Managuac," meaning "pond environment." Aside from Lake of Managua, there are many other lakes and ponds distributed in the area. In addition, In the vicinity to Lago Xolotlán, the capital is also a home to many important national scenic spots, such as the music spring, the presidential house, and national museum. Furthermore, tourists can also pay a visit to the marble engraved spring dedicated to the Nicaraguan nationally-known poet Rubén Darío as well as the Teatro Rubén Darío on the north. Once the capital of Nicaragua during colonial period, streets León brim over with colonial styles. Aside from the architectural beauty of the streets, tourists can pay a visit to the historical old Leon Cathedral, considered as the most beautiful and publicly acknowledged as the largest one in Central America. For those who like to learn about the living environment of Rubén Darío, tourists can pay a visit to Museo Rubén Darío. The old ancient relic site in León has already enlisted as one of the world heritages by UNESCO. Located on the west of Granada Lake, Granada enjoys rich history and tourism resources that will lead tourists feel abundant colonial styles. Besides, tourists can take a boat on the lake to have a view of the beautiful scenery and the wonder sight of island in the lake. Not only tourists can overlook of the city and the sceneries of lake area from the natural reserve of Volcán Mombacho, but also embrace the sight of the ecology of fauna and flora around the volcanic area. 29km away from Managua, the capital, Masaya Province is the most densely populated in Nicaragua. The city is well known for its handcrafts and Nicaraguan cuisines and is also the largest national distribution center for handcraft products. 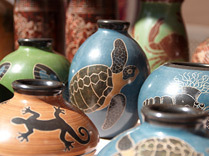 With its reputation as "Flower City -- Ciudad de las flores," the city is acknowledged as the greatest craft hub for Nicaraguan folk handicraft in 1999. The market for handcraft products will be open on each Thursday when varieties of artworks will be on sales, and tourists can also enjoy the leisure time of watching spectacular folk dance and singing performances. 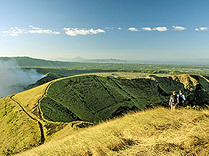 In addition, tourists can have a view of five volcanic cones in Parque Nacional Volcán Masaya, considered by tourists as one of the most gorgeous volcanoes in Central America.